Troopers stand next to a vehicle which crashed after a brief pursuit on US 35. 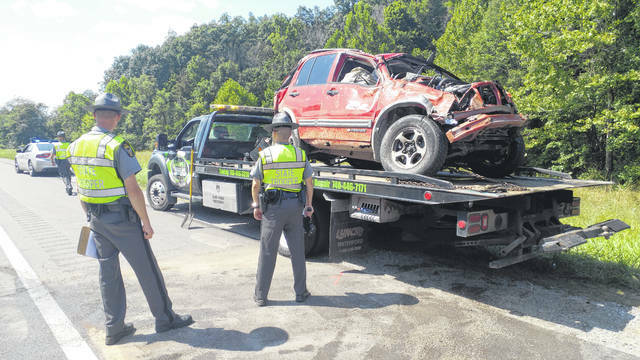 GALLIPOLIS — The Gallipolis Post of the Ohio State Highway Patrol is investigating a one-vehicle crash involving one injury that occurred due to a pursuit on US 35, Tuesday. Joseph Billingsley, 38, of Pomeroy, in a 2002 Chevrolet Tracker, was traveling westbound on US 35 reportedly with a loud exhaust violation observed by law enforcement. Troopers says the vehicle continued westbound while making several marked lane violations. A pursuit was initiated when Billingsley reportedly failed to stop for lights and a siren. The Tracker eventually lost control, slid into the median, overturned and ejected the driver. Billingsley, according to OSHP Commander Barry Call, was traveling around 100 mph. He suffered non-incapacitating injuries, said reports. The pursuit started by milepost 17 and traveled approximately two miles before ending near milepost 15. The patrol was assisted by the Gallia Sheriff’s Office, Rio Grande Police Department, Ohio Department of Transportation, Gallipolis Fire Department and Gallia EMS. The crash took place on US 35 near milepost 15 in Gallia County. The roadway was closed as a result and closure lasted approximately an hour. The crash and pursuit are still under investigation.